In the new house Jamie and I have a little bit of extra room so we are “holding” a couch for his parents until either Nicole or Holly Ann have a place for it in their home. Jamie and George moved the couch over here today. It was going to go in Pipers room however, it wouldn’t make it around the corner to actually get into that room. So after a little bit of rearranging it has found a home in the guest room. Moving things around in there pushed me to clean up a little bit; up until this point that room was just a holding place for all things that hadn’t yet found a place in the house. I didn’t clean a lot but I did move some stuff off of the bed so it doesn’t look like a junk hole anymore and it is clean enough that I will leave the door open. 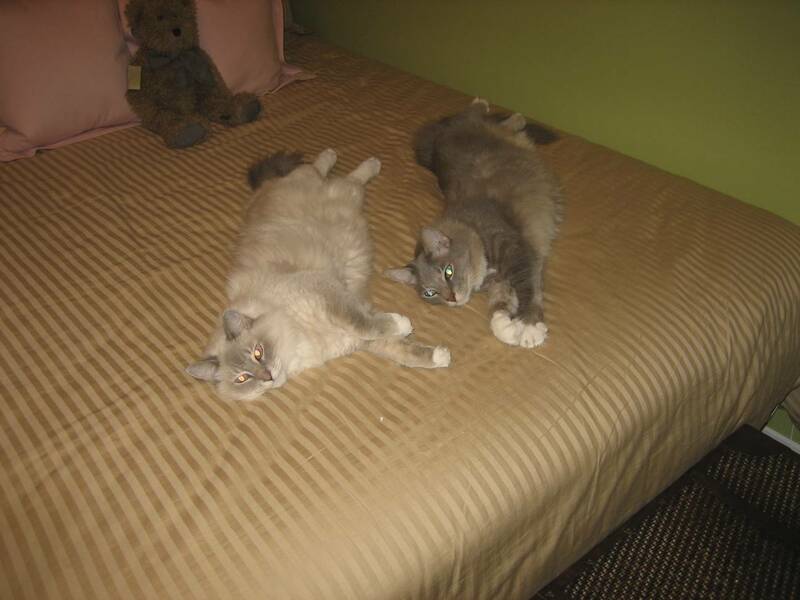 Needless to say, the kitties were really excited to have the bed to nap on again. This is how I found them tonight after dinner- they can really be cute sometimes. Do you think they could be related?